Site of the 1968 assassination of Dr. Martin Luther King, the Lorraine Motel is now the National Civil Rights Museum in Memphis, Tennessee. It reopened just last month following extensive renovations and updates. This article is something of a departure from my usual travel marketing and PR-focused blog posts. But it’s still about travel. Not aboard small expedition ships or riverboats, but rather about a 2,000-mile drive I made last week from Texas to Rhode Island. I’ve assembled some random observations about what I saw and experienced during the six-day drive that took me through 13 states. I’m not a travel blogger, but I hope you enjoy my comments. Feel free to add your own. The occasion for the trip was returning my wife Anne’s bright red Audi A3 from the apartment in Dallas to our home in Providence. I had time in my schedule—she didn’t—and wanted to see how her peppy little six-speed stick would navigate the back roads of Tennessee, the Smoky Mountains and the southern portion of the Blue Ridge Parkway in North Carolina. I’ve covered the distance several times before, but always through Oklahoma, Missouri, Illinois, Indiana, Ohio and central Pennsylvania. The southern route was decidedly more scenic, particularly once off the interstate system and into the hills. Excuse me if I temper my enthusiasm about how the car handled, as Anne will be reading this post and I wouldn’t want her to think that I in any way put the A3 through its paces. I’ll just say the car and its German engineering really allowed me to engage with the destination, if you catch my drift—certainly not four-wheel drift, mind you—and still average about 35 mpg. "There's Just Too Much Demand"
So said a European river cruise executive at a travel show in February about current market conditions, as reported recently in an article entitled "Selling River Cruises? Better Get On Board Early" in Travel Market Report. But something seems to be missing in this and other recent articles, both in the statements from the riverboat operators themselves and also in the reporting by the travel media. For me, there are two major disconnects between what I’m reading on one hand and what I’m actually seeing in the marketplace on the other. My close friends and colleagues know I love obits. I probably bore others talking about them. I tweet them. And I send them as emails to acquaintances I think might be interested in the subject’s life or work. My mother may have been responsible for this mild obsession, as she never missed what she called “the death notices” in the Dayton Daily News or Journal Herald. But then again, she used to read the newspaper from the back to the front. At least I don’t do that. Perhaps that’s a subject for another blog post. Well-written obituaries—such as those I read daily in the New York Times—are like onions. They have layers that can be peeled back to learn just a little, or a lot. 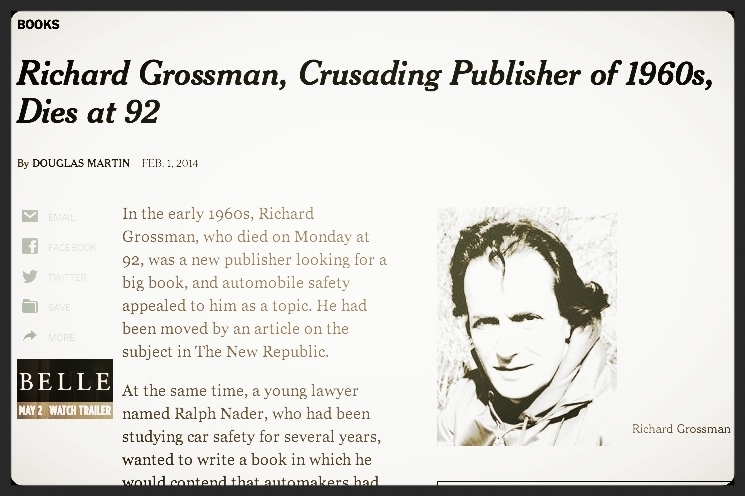 Many obits have great lessons for marketers, and that’s what I’ll explore in this post.